The Cuisinart HM-70MR SmoothStart® hand blender comes with a 220-watt motor which easily mixes the heaviest ingredients. Is built to perform any mixing task from dense cookie dough to whipped cream. Features SmoothStart® which has 3 low mixing speeds in order to eliminate splattering. The 7 Speed Hand Mixer Power Advantage Metallic Red has many exciting features for users of all types. You can extend the lifetime of your 7 Speed Hand Mixer Power Advantage Metallic Red with the purchase of a FactoryOutletStore Factory Protection Plan. See the 7 Speed Hand Mixer Power Advantage Metallic Red gallery images above for more product views. 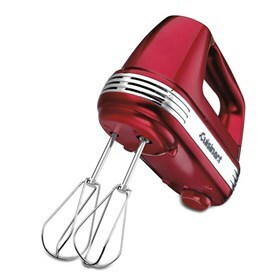 The 7 Speed Hand Mixer Power Advantage Metallic Red is sold as a Brand New Unopened Item.